A remarkable 1963 study [pdf] from the Archives of Opthalmology in which 24 blind participants took LSD to see if they could experience visual hallucinations. It turns out, they can, although this seems largely to be the case in blind people who had several years of sight to begin with, but who later lost their vision. Those blind from a very early age (younger than two years-old) did not report visual hallucinations, probably because they never had enough visual experience to shape a fully-functioning visual system when their brain was still developing. 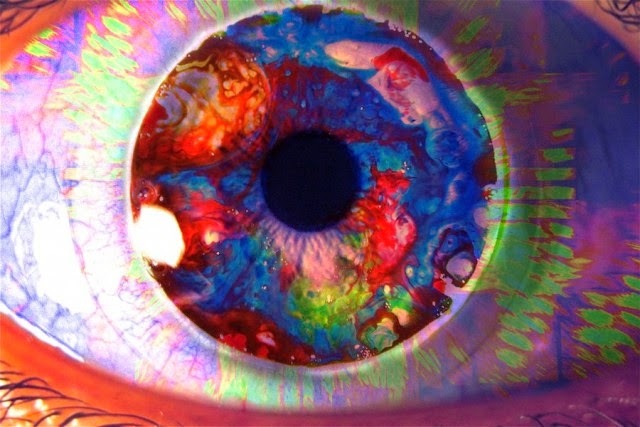 It is evident that a normal retina is not needed for the occurrence of LSD-induced visual experiences. These visual experiences do not seem to differ from the hallucinations reported by normal subjects after LSD. Such phenomena occurred only in blind subjects who reported prior visual activity. The drug increased the frequency of visual events such as spots, lights, dots, and flickers. However, the complex visual experiences reported by 3 subjects after LSD did not occur after placebo or in ordinary experience. It is interesting to note that duration of blindness was not related to the occurrence of visual hallucinations; nor was intelligence, acuity of visual memory, or use of visual imagery in speech. Three other reports deal with the effects of hallucinogenic drugs on blind subjects. Alema reported that 50 micrograms of orally administered LSD induced elaborate visual hallucinations in a subject with bilateral enucleations of the eyeball. However, the effects of 50 micrograms of LSD are stated to have persisted for the incredibly long period of 5 days (they usually last 6 hours). This subject was noted to have spontaneous visual activity. Zador administered mescaline orally in doses of 0.05 to 0.4gm to 10 blind subjects. Elaborate visual hallucinations usually followed. Most of the subjects had prior spontaneous visual activity, but it is difficult to evaluate this activity because they also had central nervous system diseases. The presence or absence of light perception was not specified for this group, and no control studies were carried out. Forrer and Goldnerr gave LSD, 1 microgram per kilogram to 2 blind volunteers, both of whom had suffered destruction of the optic nerves. Neither reported visual hallucinations, no mention was made of prior spontaneous hallucinations, and no mention was made of prior spontaneous visual activity.